This authentically detailed collectible is a licensed reproduction of the sword prominently featured in the hit television series HEROES. Meticulously created from the actual prop sword using the finest grade materials and craftsmanship of the highest quality available. Close attention to quality is a top priority in every piece. This limited edition and highly detailed sword is crafted with a tempered, hand forged high carbon blade, just like the actual television prop. It features a genuine leather-wrapped handle, genuine rayskin covered grip, and solid brass helix ornaments. Each sword is presented with a wood shoulder scabbard and a wood display stand. Each of these adult collectibles are individually laser serialized to ensure authenticity. 42" overall. 28 1/2" blade. Full Tang, extremely sharp, and fully functional. Hand forged 1040 carbon steel blade. Solid brass tsuba and fittings. Genuine ray skin and leather wrapped handle. Stunning high quality Heroes Helix symbols on both sides of the handle. Blade Length: 28 1/8 in. Handle/Scabbard Material: Hardwood with piano paint finish. Package includes genuine leather back strap, COA, Helix info scroll, display stand with logo, and retail packaging. Now you too can save the world! I purchased this sword for my wife, it is a good quality blade, sturdy and aside from a small defect in the blade of a slight right angle in the tip about 1-3 inches there was nothing wrong with it. As a display piece no one would be the wiser that there is any such defect unless you look very closely down the blade itself. True swords had already notified me of this before purchase so I was already aware of it. The service was swift and I was able to keep track of the item until it arrived at my home. A must have item for anyone who is a dedicated fan of the series, or simply enjoys a beautiful display piece. Great Sword. Totally worth the money. The only problem I had was that it took forever to get. But once I got it, I loved it. Especially because I am a fan of the show Heroes. Just recieved this sword last night and I was amazed! Not too heavy, and definitely not cheaply made. Very fine quality of everything. Handle is wrapped securely and the helix on both sides of the handle are attached very well. Also comes with an extra helix on a string that is supposed to be draped from the sword stand as shown in the picture, but I decided that I was going to make a necklace out of it and it looks awesome! Definitely a great buy, especially since I am such a HUGE Heroes fan! Absolutely worth the price. 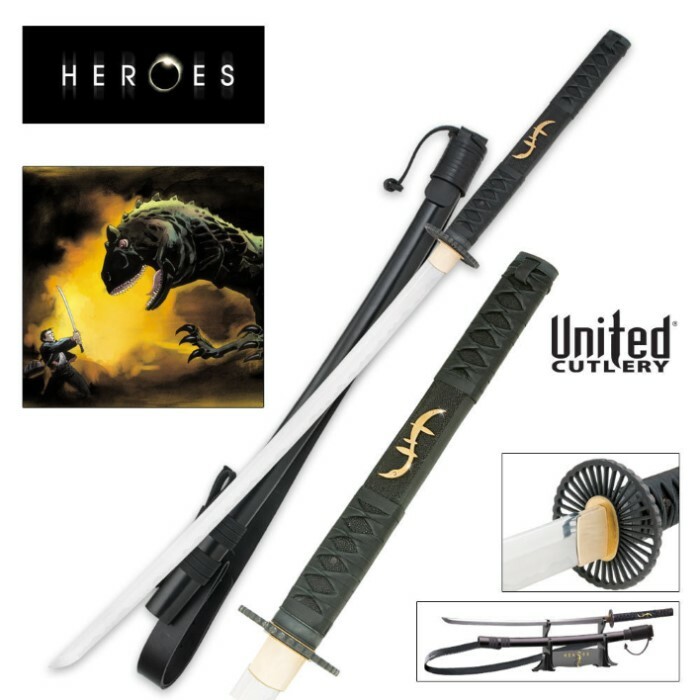 Heroes fan or not, this sword is quality made, very sharp and displays beautifully. Overall the sword looked fantastic. Even when looking closely the wrap on the handle is tightly wrapped, the blade is of high quality carbon steel and razor sharp, its full tang and the ornament is tightly secured on the handle. It arrived promptly with in 3 days of placing the order and came in a very nice box and the stand that comes with it is very nice with velvet covering where the sheath goes. Overall an awesome buy for any fan of Heroes or just swords. MUST HAVE!! !